It is that time of the year when we sit down to think what trends will rule the coming year. Knowing the future has always fascinated the mankind, hasn’t it? For good reason, of course. Unless we know what’s coming up how do we determine what to do next … and thus remain competitive? So we did the hard work for you and came up with a few trends that you are likely to encounter in 2019. Here they are! It’s hard to imagine a hotter B2B marketing tactic than ABM. While CRM is the system of record for all sales activity and marketing automation systems are used by almost all sophisticated B2B marketers, each carries well known limitations. In particular, both focus on known, individual contacts. In an account-based world, that’s not enough. As a result, ABM platforms are quickly becoming the third leg to the B2B marketing tech stack. Together with CRM and marketing automation solutions, B2B marketers can span individual to account, and known to unknown in their marketing and sales activities. According to Marketo’s 2017 Marketing Benchmark Report, 34% of marketers have some form of ABM programme in place. According to Demand Gen Report’s ABM benchmark survey, it’s likely that around half of them launched that programme within the last year. One of the biggest roadblocks of B2B is alignment between sales and marketing. This becomes even more critical when using ABM to develop strong relationships with prospects and customer. According to a recent Forbes article, 50% of B2B sales staff consistently miss their quotas. By the time prospects do come out of the shadows to engage a sales rep, 80% of the traditional purchasing cycle has already been completed. Despite a wide number of communication channels being open to businesses, email still leads the race. As the default mode of communications, marketers must recognize one-to-one email as the workforce behind B2B marketing. Authenticity is the key to making one-to-one email effective for developing relationships. Before potential customers will consider your products or services, they must trust your business, which means proving to customers that their challenges and needs matter to you. When using email for B2B marketing, marketers can begin by orienting the messaging to the department or industry of the recipient, and then working down to the account level to address the pain points facing that customer. Yes, you’re ultimately selling a good or service, but you’re doing so in a way that presents your company as a trusted partner. Since one-to-one email is a trusted and authentic medium, consider including relevant call-to-action banners within the email. That way, you can keep your language focused on them, while a strong display ad drives your brand and demand activity. Marketers, be warned. As email volume increases, B2B relationships start to live or die, so make sure the emails you send are authentic! "LinkedIn has changed dramatically as a platform ... and most people haven’t adapted their LinkedIn strategy. Years ago, this platform was a place where people would spam each other or put up resumes. 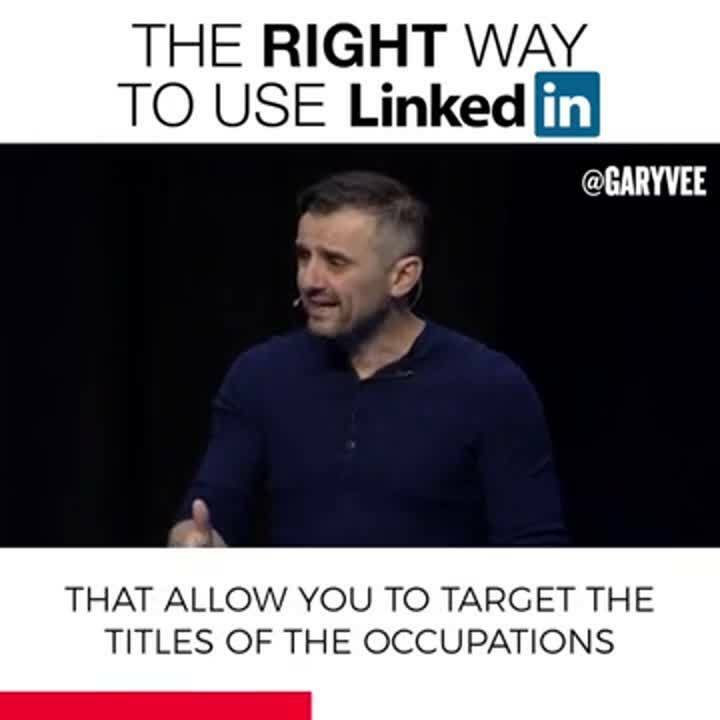 Now, LinkedIn has become more of a content platform with a phenomenal amount of opportunity … if you use it right. " - Gary Varyberchuk. 81% of businesses now use video as a marketing tool — up from 63% in 2017. 97% of marketers say video has helped increase users’ understanding of their product or service. Here are different types of videos. You may choose what suits your business. Explainer Videos: To provide a quick, highly visual overview of key features, or how a product or service works. Screencast: A capture of what’s happening on the screen of a computer or handheld device. This is often used to demonstrate a software product. Selfie Style video: A video that primarily features an actual person talking on screen. Motion Graphics: Video in which moving graphics are used. Get to the point quickly - no rambling. Avoid corporate speak and use simple words. Use visuals to engage the audience. promises one big thing (as opposed to many small things). Achieves a known desired end result offers immediate gratification. Can be consumed in a very short time (like 5 minutes). The lead magnet is a good start but you want to get the prospect to buy your offer. And this offer is generally on your flagship product or service. Headline – Write 25, pick 5 and test them all! Marketing communication is becoming less and less formal. There is a misconception that B2B copy must be corporate speak. Readers don’t have the patience to sift through formal, stiff writing. Use more “you” words (you, your …) than “we” words (we, us, our…)! Highlight both the features and benefits of your product. Here is a classic headline that is conversational and benefit-driven: Accounting Software for Business Owners who dislike Book-keeping! As competition becomes more intense, it is natural that customers expect more and stronger proof from us. Quite a few products and services in the B2B market are too complex to explain using a brochure or a letter. This is where case studies (or customer success stories) can help. Written in an editorial style, they tell the tale of “product meets customer” and how everyone lived happily ever after. Case studies are an interesting mix of brochure, testimonial and article. The challenge: What condition the customer was trying to change or improve. The customer: What the customer does or makes. The journey: What steps the customer took, what products/ services he tried out earlier and why they didn’t work out. The discovery: How the customer came to know about your product/ service. The implementation: How the product or service was implemented, highlighting any instances where you went “the extra mile”. The results: How much cost savings, revenue growth, sales growth or return on investment the product implementation achieved. There you have it – eight B2B marketing trends that you want to be prepared for!